Becoming a mum is one of life’s greatest gifts. While there’s no doubt that bringing a bundle of joy into the world is rewarding, it can also take its toll on every area of a woman’s body. And her skin is no exception. Hormonal changes, lack of sleep, stretching skin and a lack of routine all contribute to short and long-term changes in skin tone and elasticity. Not only that, new mums are also susceptible to completely new skin complaints too. Coupled with the fact that the harsh chemicals in many products designed to treat these ailments often make them unsuitable for breastfeeding mums, skincare can become a serious issue for many mothers and their babies, regardless of their age. If you’re a new mum and you have post-natal skin concerns in yourself or your baby, keep reading for Biologi’s chemical-free solution. Changes to sleep patterns are almost unavoidable in those first few months of motherhood, and the eyes are the first tell-tale sign that a mum hasn’t been getting her full eight hours. Night feeds and sickness combined with hormonal changes can mean that post-natal slumber is reduced to little and often. Or in many cases, just little. With a lack of sleep comes the unavoidable dark circles under the eyes. There are a few reasons dark circles appear more prominent after a hard night on the (milk) bottle. Dark circles are the blood vessels that appear under the thin layer of skin surrounding the eye area. The body responds naturally to lack of sleep with a surge in cortisol, a hormone designed to help the body through stressful situations such as lack of energy. Cortisol increases the blood flow in the body which causes the blood vessels to become more prominent. The way to alleviate dark circles is not to reduce the blood flow, but to work on stimulating collagen and elastin to firm up the barrier in the delicate eye area so blood vessels become less visible. Retinoids are a common treatment for dark circles but due to the high vitamin A content, these harsh products aren’t always suitable for women who are breastfeeding. While makeup seems like the obvious go-to solution, heavy foundation can often highlight fine lines and end up exaggerating the problem. For dark circles, Bk serum is your one-bottle wonder. 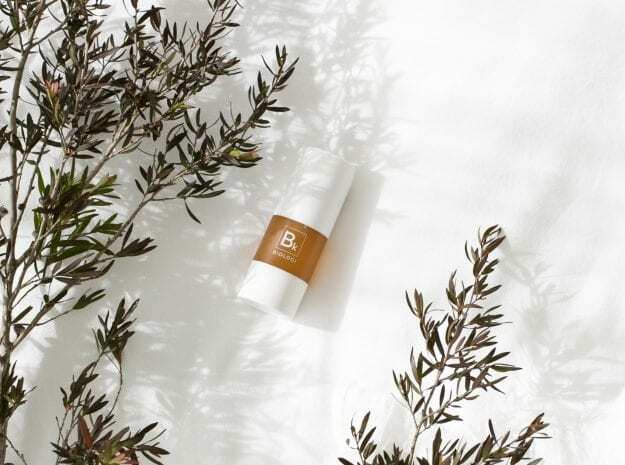 Containing natural vitamin C, Bk serum is chemical-free and is a natural way to firm up the skin under the eye area to conceal the blood vessels. Bk serum is 100% safe for breastfeeding mums, and regular use will see your dark circles disappear right before your (very tired) eyes. Pregnancy puts a woman’s body under enormous pressure and can leave breasts and bellies lacking firmness and elasticity, or as it’s commonly known, sagging skin. The most effective way to firm up sagging skin is with natural vitamin C (note, synthetic vitamin C, otherwise known as ascorbic acid isn’t the same, see our article here). The natural vitamin C content in Biologi serums can help your skin produce collagen and elastin. It’s a 100% natural active and entirely safe for use even when breastfeeding. Pair Bk with the tryptophan and phenolic acids found in Finger Lime (the only ingredient in Bf serum), and your skin has its best chance to strengthen and repair. Apply liberally to common problem areas such as breasts and bellies with no worry that the baby will ingest toxic chemicals when breastfeeding or delivering those adorable slobbery kisses to mum! Biologi serums are so natural they’re safe enough to drink, even for a newborn. Pregnancy and breastfeeding may mean a mum is unable to use her regular anti-aging products because of the high chemical content. Coupled with the sleepless nights and interruption to routine, a new mum might notice her skin aging faster than she’d like. Bk serum contains natural vitamin C content. Its potent anti-oxidising properties will even out skin tone, smooth fine lines, and give new mums a glow that they won’t find in any other bottle on the market. Bk has the highest level of natural vitamin C found in any product in the world, and because it’s all natural, it’s completely safe for new mums. It’s not just mums who need and deserve lots of Tender Loving (skin)Care. Babies have delicate skin, and to avoid further irritation, you must choose products carefully. Unfortunately, many ‘baby-friendly’ products on the market aren’t free of chemicals, preservatives, perfumes, fragrances and essential oils like you’d expect. Quite the opposite. many products use ingredients that cause sensitivity to the skin and should be avoided on delicate baby’s skin. When it comes to nappy rash, the best solutions nourish and hydrate, rather than just create a barrier to ‘protect’ the skin. While barrier products keep moisture out, they also keep toxins and harmful ingredients in. Any synthetic ingredients (like paraffin wax) and highly acidic moisture that the nappy has trapped, are now blocked in the baby’s deeper skin layers which will inevitably lead to further irritation. When your little one has a nappy rash, the skin is inflamed. Applying a 100% natural, unprocessed product will ensure no further irritation. Combine with actives to stimulate the repair of the inflamed skin and our Bf serum is the ideal product. Bf serum is chemical-free and is suitable for everyday use so apply liberally with no risk of further irritation. Cradle cap is linked to overactive sebaceous glands potentially caused by the baby retaining some of mum’s hormones after birth. The excess sebum causes old skin cells to stick to the scalp, instead of drying up and falling off as they would typically do. Cleansing the skin and regulating oil flow with an enzyme exfoliation will help break down the protein bond that’s stopping the dead skin cells from dropping away. You can do this safely with our Bd serum. The tartaric acid in its natural form is 100% pure, unprocessed and will clear away any blockages to control the oil flow. Milia is a group of milium cysts that typically appear on a baby’s nose, cheeks, chin, forehead or around the eyes. While completely harmless, the oil glands on the baby’s face are still developing which causes dead skin cells to become trapped in the small pockets near the surface of your baby’s skin. Regularly applying Bd serum will regulate the oil flow offering a gentle solution and prevention to the white spots commonly found on newborns. Biologi serums are free of preservatives and synthetics, 100% active, and the best bit…they work. As a new mum, there are plenty of things to worry about for you and your baby, there’s no need for skincare be one of them.